Anderson Chiropractic | Daily Life Intention Check In: Are you drinking enough water? Home>Nutrition >Daily Life Intention Check In: Are you drinking enough water? We’re six days in to January and we set out daily life intention of drinking water. We didn’t make it an absurdly difficult goal to start off the new year. In reality, it’s really simple. Just drink eight 8 oz glasses of water a day. But here’s the thing…I found this hard to do. I’ll admit it! I checked in with Heather and she admitted the same thing. I talk to people all the time about making sure they stay hydrated and yet I wasn’t drinking enough water myself. I rely on a lot of tea through my day…I love the taste, it gives a boost of caffeine, and it’s a warm drink in these Canadian winters! But, BUT, I wasn’t drinking enough water. So, if you’re in the same boat, you’re not alone. I discovered this app that will help you stay on track. It actually reminds you to drink your water and it tracks how much water you’ve consumed throughout the day. Pretty smart, eh? 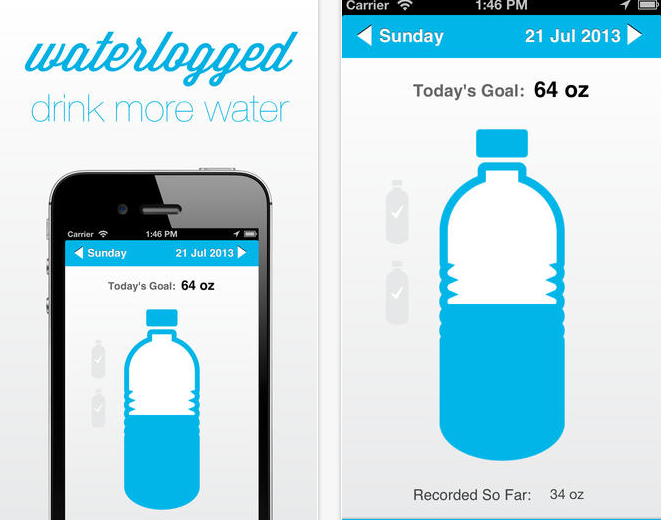 It’s called WaterLogged and it’s a fun and easy way to keep on track of drinking enough water. So, keep drinking (water) my friends! I’ll check in later this week….